Jewel cichlid is another one of all those cichlids that has gotten a bad reputation for being aggressive without actually deserving it. Sure, jewel cichlids are aggressive if your used to keeping in Guppy and Danios and compare them to fish like those, but this doesn’t really mean that they aggressive. The truth is that Jewel cichlids seldom bother fish of other species outside it’s own outside the breeding period and you can’t really blame them for chasing away any other fish that approaches their fry. My experiences with jewel cichlids are that they without any problems can be kept in most community aquariums as long as to fragile species are avoided. You should however be able to keep them with just about any cichlid that grows larger then 10cm/ 4 inches as well as with many species of dwarf cichlids. Other suitable companions for Jewel cichlids include danios, silver dollars, cory cats, sucker mouth plecos, different barb species, synodontis catfish and a number of other fishes. Jewel cichlids are very hardy fish that can adept to most surroundings as long as there are caves and a few flats rocks present. They are not suitable for aquariums of less than 150 L / 40 gallon. A smaller aquarium can be used to house a single pair for breeding purposes. 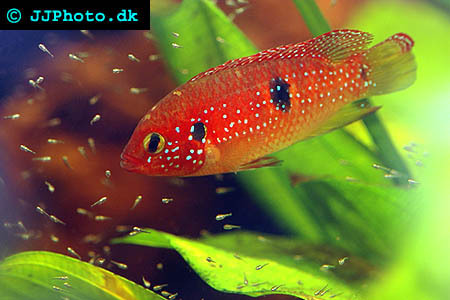 Jewel cichlids do best with pH 6.5-7.5 but will accept pH 6-8 and temperature 23-27C / 74-80F. Jewel cichlids likes to dig which disturbs plants and can often destroy plants if they are kept in planted aquariums. There is however number of plants that will do well in an aquarium with jewel cichlids and a number of other species that will do well as long as you protect their roots with stones around their base. Examples of plants that do well if you cover their base are different type of Amazon Sword plants and Cryptocoryne species. Plants like Anubias species and Java fern do well without any cover for their roots as these are hardy plants that shouldn’t be planted in the bottom substrate but rather attached to rocks and pieces of bogwood. This is just a few examples of suitable plants and there are many more available. You can try to keep more fragile plants with your jewel cichlids since some fish are less likely to destroy plants than other individuals. I do however not recommend that you try very fragile plants such as Cabomba and Rotala species. Jewel cichlid will according to my experience accept everything you try to feed them and will do well on a diet of pellets and the occasional live and frozen food. A diet like this sufficient to get jewel cichlids into spawning condition provided that you keep the water clean and offer them suitable spawning sites. It is said that the hardest part when trying to breed jewel cichlids is to get a compatible pair but this is according to my experience with this fish not a problem at all. You can buy a single pair and these will form a pair as long as you buy a female that is a little smaller then the male. Larger females only seldom accept smaller males. However if this shouldn’t work for you as it has for me your best bet is to buy a small group of young jewel cichlids and let them grow up and from pairs by there own will. Jewel cichlids spawn on an in advanced cleaned flat rock where the female lays up to 500 days which are immediately fertilized by the male. The parents guard the eggs and fry until they reach a length of about 1 cm/ 0.4 inch at which time it is best to remove the fry from the parents. The fry will accept newly hatched brine shrimp once they have consumed their yolk sac and can be feed mashed pellets and flake food a few days to a week later. My experience with this species says that they are good parents however the species have a reputation to often be bad parents so I recommend that you at least give the parents a chance to prove that they are good parents before you start raising they fry separated from their parents. Never remove all fry from the pair as this might cause aggression (even fatal aggression) within the pair. This fish is according to me just as the name suggest a jewel and I recommend everyone how are considering keeping jewel cichlids to give them a chance. Spawning Stomatepia pindu - This mouthbrooding cichlid comes from a crater lake in Cameroon, West Africa.